The Bishop of Shrewsbury has reminded the people of the Diocese that it is their faithfulness which is crucial to the mission of the Church. In a pastoral letter read in Masses over the weekend of the First Sunday of Lent, the Rt. Rev. Mark Davies spoke of the need to build-up the missionary parishes needed for the future in line with Pope Francis’s call to be “in a permanent state of mission”. The Bishop suggested that focusing exclusively on parish closures would be to ask the wrong question. The real question is, he said, how can we continue and build-up the Church’s mission in every place? The Bishop announced a forthcoming fund-raising appeal through which Catholics of the Diocese can choose to financially contribute to pastoral and missionary goals, including the training of a new generation of priests, the formation of lay catechists, the creation of a youth mission team and efforts to promote and support the vocation to marriage and to develop the social mission of the Church. The plans will also entail “a fresh look at our planning for the parishes of the future”, Bishop Davies said in his pastoral letter. The Bishop reminded parishioners that the ultimate guarantee of the future mission of the Church was being true to the faith that they have received and, above all, their faith in the Holy Eucharist. 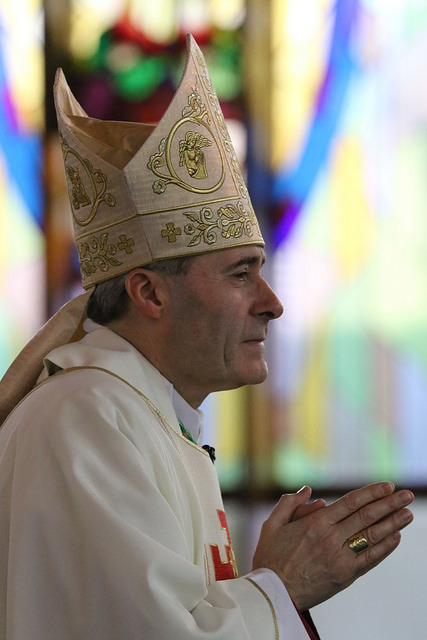 Bishop Davies said: “I am sometimes asked whether it is my plan to close parishes. I would suggest this is the wrong question to ask. The real question is surely this: how can we continue our mission in every part of the Diocese? “I hope we will always be realistic enough to recognise situations where we can no longer sustain a parish structure or a church building. However, it has never been my wish to see parishes close. “Indeed, it has been a great joy as your bishop to celebrate Mass in every parish, and to see how the Church’s mission continues through your faithfulness. He said: “I am certain that, at this moment in history, we face a choice: either to be weighed down by problems, and there will always be problems until the end of time, or to recognise anew the abundance of grace given us now to accomplish our mission. Please follow this link if you would like to offer the Diocese your feedback on the building of missionary parishes.